april 2018 / the tasting panel / 85 So how do we move the needle forward? This can only happen if we're open to listening and understanding what women and marginalized people have gone through—and continue to go through—as they seek to further their careers. If we want to be the change, we must understand it won't happen overnight, but using the tools and resources at our disposal will make all the difference in the world. Over the past few months, I've spoken with individuals across a wide spectrum of professional roles to hold an open dialogue on problems impacting so many of us: racism, sexual harassment, marginalization, and a lack of understanding surrounding the concept of intersectionality. The conversations were honest, and I felt safe enough to speak my truth on what representation in this industry looks and feels like. The more people I spoke to, the more I realized I was not alone. As a writer, my job is to tell stories, and through this column I hope to introduce you to people and companies who desire to see our industry thrive at a level that's more welcoming of diverse talent than ever before. Welcome to Tasting Inclusion: Grab a drink, take a seat at the table, and let's get started. 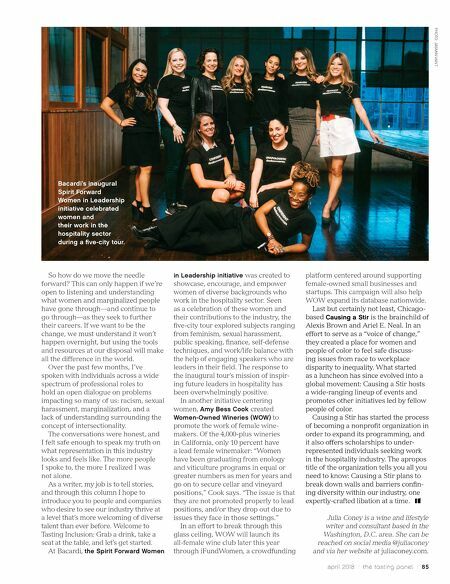 At Bacardi, the Spirit Forward Women in Leadership initiative was created to showcase, encourage, and empower women of diverse backgrounds who work in the hospitality sector. Seen as a celebration of these women and their contributions to the industry, the five-city tour explored subjects ranging from feminism, sexual harassment, public speaking, finance, self-defense techniques, and work/life balance with the help of engaging speakers who are leaders in their field. The response to the inaugural tour's mission of inspir- ing future leaders in hospitality has been overwhelmingly positive. In another initiative centering women, Amy Bess Cook created Women-Owned Wineries (WOW) to promote the work of female wine- makers. Of the 4,000-plus wineries in California, only 10 percent have a lead female winemaker: "Women have been graduating from enology and viticulture programs in equal or greater numbers as men for years and go on to secure cellar and vineyard positions," Cook says. "The issue is that they are not promoted properly to lead positions, and/or they drop out due to issues they face in those settings." In an effort to break through this glass ceiling, WOW will launch its all-female wine club later this year through iFundWomen, a crowdfunding platform centered around supporting female-owned small businesses and startups. This campaign will also help WOW expand its database nationwide. Last but certainly not least, Chicago- based Causing a Stir is the brainchild of Alexis Brown and Ariel E. Neal. In an effort to serve as a "voice of change," they created a place for women and people of color to feel safe discuss- ing issues from race to workplace disparity to inequality. What started as a luncheon has since evolved into a global movement: Causing a Stir hosts a wide-ranging lineup of events and promotes other initiatives led by fellow people of color. Causing a Stir has started the process of becoming a nonprofit organization in order to expand its programming, and it also offers scholarships to under- represented individuals seeking work in the hospitality industry. 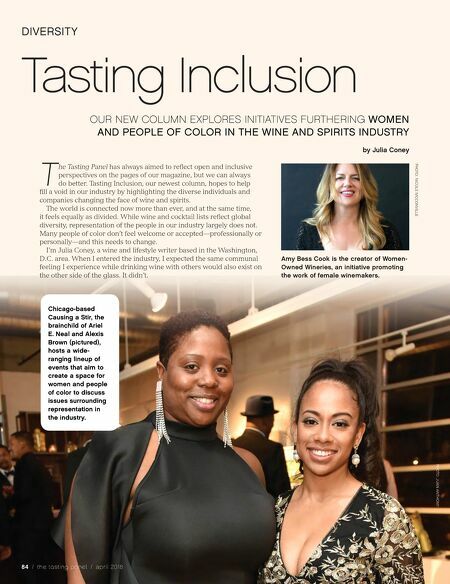 The apropos title of the organization tells you all you need to know: Causing a Stir plans to break down walls and barriers confin- ing diversity within our industry, one expertly-crafted libation at a time. Julia Coney is a wine and lifestyle writer and consultant based in the Washington, D.C. area. She can be reached on social media @juliaconey and via her website at juliaconey.com. PHOTO: JASMIN VAN T Bacardi's inaugural Spirit Forward Women in Leadership initiative celebrated women and their work in the hospitality sector during a five-city tour.